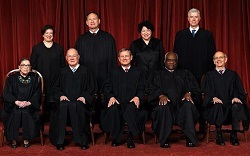 Are There Too Many Jews on the Supreme Court? The latest example comes by way of an article originally published by Religion News Service on July 11; it has been picked up as an op-ed by several newspapers. "Catholic-Heavy Supreme Court Moves Right as the Church Moves Left." That is the title of an article by Jacob Lupfer. What occasioned Lupfer's concerns about a "Catholic-Heavy" Supreme Court was President Trump's selection of Judge Brett Kavanaugh to sit on the Supreme Court. Lupfer describes Kavanaugh as a "doctrinaire conservative," one who is "more heavily and outwardly invested in his Catholic identity than his mentor [Justice Anthony Kennedy]." Is this because Kavanaugh is a lector at his parish? Is it because the nominee cited his work helping the poor while working for Catholic Charities? The red flag thrown by Lupfer was followed by some red meat for anti-Catholic bigots. He says Trump is "exacerbat[ing]" and "heighten[ing]" the "angst (or excitement)" about "the institution's ever more conservative Catholic majority." In other words, it is not the bigots who are to be blamed for raising the issue about too many Catholics on the high court, it's Trump's fault. In her questioning of Barrett, Feinstein said of her, "The dogma lives loudly within you." We all know what that meant. Lupfer manages to spin Feinstein's bigoted comment saying it was nothing more than a "gaffe." No, a gaffe is unintentional. Feinstein's comment was scripted. And she never apologized. Worse, Lupfer then accuses Feinstein's critics of using her remark as a "rallying cry for conservatives enthralled with the notion that devout, orthodox religious people are systematically excluded from positions of elite influence, and particularly positions of legal authority." In other words, when those offended by bigoted comments complain, they are exploiting the issue. Would this apply to others as well, or just Catholics? Lupfer offers a dire warning. "The triumph of conservative Catholicism on the court has a dark lining," he informs. The "darkness," he says, is evident in the way "the Catholic Supreme Court" has ruled on liberal causes. "The Catholic Supreme Court?" Kavanaugh, who is Catholic, may replace Kennedy, who is also Catholic. The other four Catholics are Chief Justice John Roberts, Justice Clarence Thomas, Justice Samuel Alito, and Justice Sonia Sotomayor. It should be noted that Sotomayor identifies as a "cultural Catholic," not a practicing one.